1. Use dynamic driver unit, enhances the audio resolution of music and creates an immersive musical experience. 2. Adopted CSR8645 bluetooth chip, which support APT-X lossless decoding technology, brings you more natural sound. 3. Built-in magnet keeps headphones together around your neck when not in use and prevents from falling off. 4. 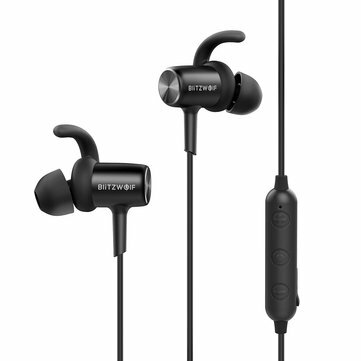 IPX4 waterproof, protect your earphone from sweat, splash and etc. that will damage components. 5. Accurate CNC engineered cut and attractive CD finish provide you visual enjoyment. 6. 110mAh Lithium Polymer battery, low power consumption, support up to 7 hours playback or call time. 7. Smart voice prompt indicate you about the real time state of your earphone. 8. Line control panel and built-in microphone guarantees more convenient life.